Thomas Spencer Monson (1927-2018), the sixteenth president of the Church of Jesus Christ of Latter-day Saints died of natural causes on January 2, 2018 at the age of 90. Except for a short stint in the military, Monson was employed for his entire life by the LDS Church. He will be replaced by senior-ranking Apostle Russell M. Nelson, 93. Monson was married to Frances Beverly Johnson Monson (1927-2013) in the Salt Lake temple in 1948. They were married for 64 years while raising three children. Monson did not remarry after his wife’s death. You write a letter to the Bureau of Naval Affairs and tell them that because of your call as a member of the bishopric, you can’t accept the commission in the United States Naval Reserve. The advice saddened Monson, but he requested and received a discharge from the military before his unit was sent to the Korean War. After that, Monson was called to be the bishop of his ward at the young age of 22. “I would not hold the position in the Church I hold today had I not followed the counsel of a prophet,” he wrote in a church magazine (“Follow the Prophets,” Ensign, January 2015, 4-5). At that time, Monson’s ward had 1,000 people, including 85 widows. At the age of 31, he became a mission president in Canada. Monson worked for church-owned Deseret News in the advertising and sales departments and eventually became a general manager. On October 4, 1963 at the age of 36, Monson became an apostle, the youngest commissioned in 53 years. From 1965 to 1968, Monson was in charge of the church’s operations in the South Pacific and Australia and organized the first stake in Tonga. He also oversaw operations in Eastern Europe and helped set up the first stake get in East Germany, eventually helping a temple to get built in the Communist country in 1985. His publishing experience qualified him to work with church publications such as KSL Newsradio and Bonneville International. He also was the chairman of the Scripture Publication Committee in the 1970s, overseeing the LDS Church News along with church scriptures. In 1974, he received a master’s degree in business administration from BYU. Monson served in the First Presidency under three different presidents: Spencer W. Kimball, Howard W. Hunter, and Gordon B. Hinckley. When the 97 year-old Hinckley passed away on January 27, 2008, Monson became the sixteenth president of the LDS Church on February 3, 2008. He selected Apostles Henry B. Eyring and Dieter F. Uchtdorf as his counselors. 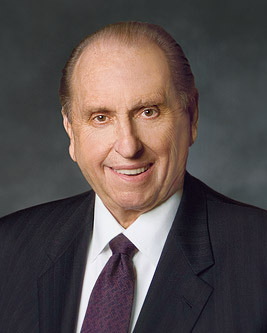 Later in his life, Monson was rumored to be struggling with Alzheimer’s Disease. In a October 2015 general conference talk titled “Be an Example and a Light,” Monson appeared to forget what he was supposed to say as he attempted to finish the 11-minute talk. (Just a few years before his talks were typically 18-22 minutes in length.) His two talks at the April 2016 conference were scaled down to an average of 4 minutes each, as his handlers knelt behind and beside him as he spoke from the conference pulpit. When he was finished, the lights were dimmed and he was helped back to his seat. My dear associates in the work of the Lord, I implore each of us to prayerfully study and ponder the Book of Mormon each day. As we do so, we will be in a position to hear the voice of the Spirit, to resist temptation, to overcome doubt and fear, and to receive heaven’s help in our lives. I so testify with all my heart in the name of Jesus Christ, amen. A month after that conference, church officials announced on May 23, 2017 that Monson would no longer attend leadership meetings or make future public appearances “because of limitations incident to his age.” He was conspicuously absent from the October 2017 general conference. Although some wondered if the church would dedicate a church manual to his teachings as they did for all his predecessors (Teachings of Presidents of the Church), it was apparently decided not to do so for 2018 since Monson was still living. Instead, church members will study general conference talks on the second and third Sundays of each month. It appears the annual series that began in the late 1990’s ended with Gordon B. Hinckley’s volume printed in 2016 and studied throughout 2017. 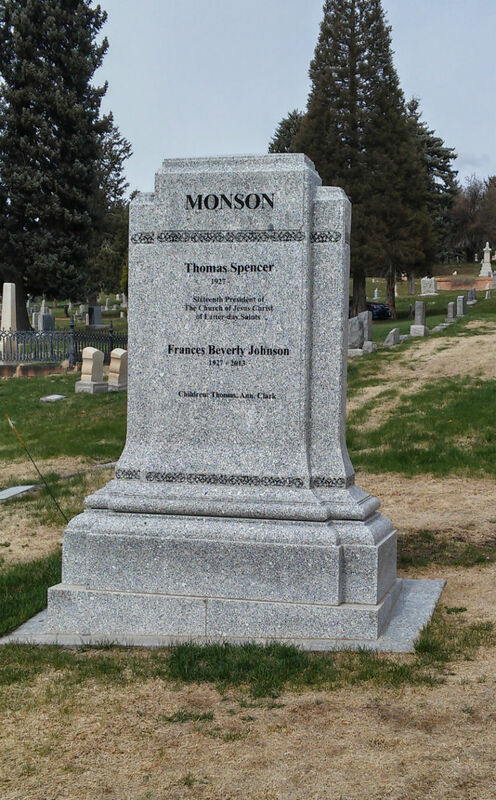 Monson will be buried near his wife, Francis in the Salt Lake Cemetery located not far from Temple Square in Salt Lake City, Utah. See the article What happens with the prophet becomes mentally incapacitated? Listen to Bill McKeever’s take “Mormonism after Monson,” the Viewpoint on Mormonism podcast on 1/8/18. Also see Sharon Lindbloom’s take on the passing away of this prophet. “It is the celestial glory which we seek. It is in the presence of God we desire to dwell. It is a forever family in which we want mem­bership. Such blessings must be earned” (“An Invitation to Exaltation,” Ensign, May 1988, p. 56). “Paramount is the responsibility to coordinate personal and fam­ily preparedness efforts, including food storage” (“The Bishop-Center Stage in Welfare,” Ensign, November 1980, p. 90). “All who hold the priesthood have opportunities for service to our Heavenly Father and to His children here on earth. It is contrary to the spirit of service to live selfishly within ourselves and disre­gard the needs of others. The Lord will guide us and make us equal to the challenges before us. Remember His promise and counsel: ‘The power and authority of the higher, or Melchizedek Priesthood, is to hold the keys of all the spiritual blessings of the church—To have the privilege of receiving the mysteries of the kingdom of heaven, to have the heavens opened unto them, to commune with the general assembly and church of the Firstborn, and to enjoy the communion and presence of God the Father, and Jesus the mediator of the new covenant.’ To merit this bless­ing, it is necessary for each of us to recall who is the Giver of every gift and the Provider of every blessing” (“The Priesthood—A Sacred Trust,” Ensign, May 1994, p. 50). “God our Father, and Jesus Christ, our Lord, have marked the way to perfection. They beckon us to follow eternal verities and to become perfect, as they are perfect (see Matthew 5:48; 3 Nephi 12:48)” (“An Invitation to Exaltation,” Ensign, May 1988, p. 54). “Though the task seems large, we are strengthened by this truth: ‘The greatest force in this world today is the power of God as it works through man.’ If we are on the Lord’s errand, we are en­titled to the Lord’s help. That divine help, however, is predicated upon our worthiness” (“Your Eternal Voyage,” Ensign, May 2000, p. 46). “Don’t put your eternal life at risk. Keep the commandments of God” (“Preparation Brings Blessings,” Ensign, May 2010, p. 66). “Joseph Smith’s last great act here upon the earth was one of selflessness. He crossed the room, most likely ‘thinking that it would save the lives of his brethren in the room if he could get out, . . . and sprang into the window when two balls pierced him from the door, and one entered his right breast from without.’ He gave his life; Willard Richards and John Taylor were spared. ‘Greater love hath no man than this, that a man lay down his life for his friends.’ The Prophet Joseph Smith taught us love—by example” (“The Prophet Joseph Smith: Teacher by Example,” Ensign, November 2005, p. 69. Ellipses and bold in original). “As always, the proceedings of the conference will be available in the coming issues of the Ensignand the Liahona magazines. I encourage you to read the talks once again and to ponder the messages contained therein. I have found in my own life that I gain even more from these inspired sermons when I study them in greater depth” (“God Be with You Till We Meet Again,” Ensign, November 2012, p. 110. Also see Ensign, May 2010, p. 113, April 2013, p. 8 and May 2013, p. 113). “By obedience to God’s commandments, we can qualify for that ‘house’ spoken of by Jesus when He declared: “In my Father’s house are many mansions. … I go to prepare a place for you … that where I am, there ye may be also” (John 14:2-3)” (“An Invitation to Exaltation,” Ensign, May 1988, p. 54. Ellipses in original). “In about 1956 we recognized that our neighborhood was dete­riorating. We observed this one Halloween by the nature of the people who came in the guise of ‘Trick or Treat.’ The minority elements were moving into the area where we lived, and many of the old-time families had long since moved away. Seeking coun­sel, I visited with Mark E. Peterson, who for many years had been the General Manager of the Deseret News. O. Preston Robinson, my former professor of marketing at the University of Utah, had suc­ceeded Brother Petersen as the General Manager at the News. As I mentioned to Mark my dilemma, wondering if it would be unfair for me to move, he said simply, ‘Your obligation to that area is concluded. Why don’t you build a house in my ward?’” (On the Lord’s Errand: Memoirs of Thomas S. Monson, 1985, p. 184). For other LDS leader obituaries, click here.